Spiteri’s Auto Service of Belmont, CA not only provides full-service auto repair but also tire service and sales. Whether you are from out of town or a local, our staff will get you safely back on the road. With decades of experience in vehicle maintenance and repair, we understand customer service is of the utmost importance, just as much as dependable repairs. Taking the time to get to know our customers helps ensure they receive the auto repair service needed at a reasonable price, and informing them of all options. This, in turn, allows them to make educated and well-informed decisions while working within one’s budget. Specialists are always available to help customers and explain how our shop can extend the life and performance of their vehicle. Timely maintenance and repairs are necessary to avoid unexpected breakdowns and expensive repairs. Providing dealership quality auto repair, maintenance, and tire service is what we do best. Walk-in and same day service are open for oil changes, brake repair, tire sales, and service. Located conveniently at 292 Old County Rd, Belmont, CA 94002, stop by anytime or call (650) 593-4758 for service. Our Staff has ASE certified Technicians and Master Technicians who are capable of repairing all makes and models both foreign and domestic. We are specialized in hybrid and classic car maintenance, repair, and restoration as well. Extended training is provided regularly to improve and advance skills. We focus on creating tailored maintenance plans that not only help fuel efficiency but also extend performance. We consider the driver, where they drive, how they drive, and how often. In California, you also may need to worry about salt and rust. Stop by anytime and one of our auto repair specialists will be happy to inspect your vehicle and help you get back on track. We offer complete auto service including computer diagnostics, pre-purchase inspections, transmission repair, certified smog check service, and a complete selection of competitively priced tires. Additionally, we provide complete engine installation with engine warranties as high as 3 years/50,000 miles. Spiteri’s Auto Service also specializes in Tire Service, Sales, & Repair. With a large selection of tires in stock, there is no need to shop around. Timely maintenance of your tires will not only reduce tread wear but also improve fuel efficiency and safety. Regular tire inspection is important to help to maintain proper pressure, fuel efficiency, and wheel alignment. Having your wheels rotated and balanced every three or four months is necessary to extend the life of your tires. Stop by today and speak with one of our tire specialists. Amazing service! I wanted to go to the snow today, and they were able to expedite delivery of snow tires, they’re putting them on right now. Who knew I would be able to leave before noon. Always great service from a repair shop that is honest and trustworthy. 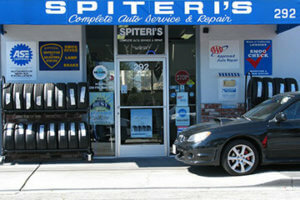 Spiteri’s Auto Service began in the garage of the 36th Avenue Mobil gas station in San Mateo in the early 1980s. We stayed at this location until 1986, when we lost our lease. Spiteri’s Auto Service went into business on Old County Road in Belmont, with Chuck and Sam Spiteri as partners. Today we have approximately 14 employees; including Chuck’s wife Kathy, who is the Office Manager. We have 4 Service Writers to help customer’s at drop-off and pick-up, with estimates and explanations; 8 technicians, 2 drivers to shuttle customers to and from the shop and an assistant in the office. Most importantly, Spiteri’s cares about our customers; many of whom have followed us from our original location. We provide estimates to our customers after complete and detailed inspections of their cars. We are honest with our recommendations and can prioritize the needs if necessary when costs exceed budget. Customer satisfaction is the foundation of our business. Whether you enjoyed your visit with us or think there are areas in which we can improve, please take a second to fill out this short survey. Your feedback allows us to better serve you!